Copyright Maia Azubel, Stanford University. Nanometre-scale gold particles are intensively investigated for application as catalysts, sensors, drug delivery devices, biological contrast agents and components in photonics and molecular electronics. Gaining knowledge of their atomic-scale structures, fundamental for understanding physical and chemical properties, has been challenging. 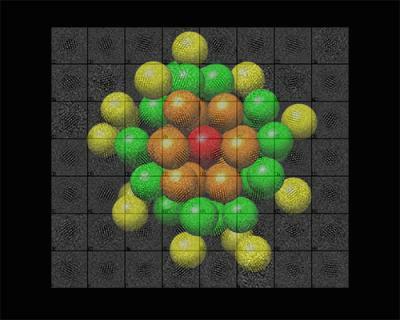 Now, researchers at Stanford University, USA, have demonstrated that high-resolution electron microscopy can be used to reveal a three-dimensional structure in which all gold atoms are observed. The results are in close agreement with a structure predicted at the University of Jyväskylä, Finland, on the basis of theoretical modelling and infrared spectroscopy. The research was published in Science on 22 August 2014. The revealed gold nanoparticle is 1.1 nm in diameter and contains 68 gold atoms organised in a crystalline fashion at the centre of the particle. The result was supported by small-angle X-ray scattering done in Lawrence Berkeley National Laboratory, USA, and by mass spectrometry done at Hokkaido University, Japan. Electron microscopy is similar in principle to conventional light microscopy, with the exception that the wavelength of the electron beam used for imaging is close to the spacing of atoms in solid matter, about a tenth of a nanometre, in contrast with the wavelength of visible light, which is hundreds of nanometres. A crucial aspect of the new work is the irradiation of the nanoparticle with very few electrons to avoid perturbing the structure of the nanoparticle. The success of this approach opens the way to the determination of many more nanoparticle structures and to both fundamental understanding and practical applications. The researchers involved in the work are Maia Azubel, Ai Leen Koh, David Bushnell and Roger D. Kornberg from Stanford University, Sami Malola, Jaakko Koivisto, Mika Pettersson and Hannu Häkkinen from the University of Jyväskylä, Greg L. Hura from Lawrence Berkeley National Laboratory, and Tatsuya Tsukuda and Hironori Tsunoyama from Hokkaido University. The work at the University of Jyväskylä was supported by the Academy of Finland. The computational work in Hannu Häkkinen's group was done at the HLRS-GAUSS centre in Stuttgart as part of the PRACE project "Nano-gold at the bio-interface."